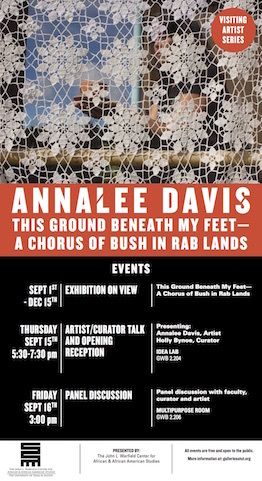 Barbadian artist Annalee Davis mines family and historical archives from the early nineteenth century and unpacks the plantation creating poetic devices that enable connection and regeneration in the exhibition This Ground Beneath My Feet – A Chorus of Bush in Rab Lands. In Rab Lands, species are resilient and fragile, ambiguous and lucid, a narrative of assumption becomes tenuous, as reimagined points of convergence come alive in fields, emerging from the belly of history within stories that have been silenced. Creating autobiographical elements that bind together sites of investigation, Davis resuscitates history by bringing to the fore concerns related to how the plantation is understood and how it defies knowing. In her exploration of wild plants and the former monoculture crop of Sugarcane, she pays special attention to the deep ancestral trauma and the legacies of slavery that have left the landscape scarred and exhausted. Davis connects her walking in the fields willingly and purposefully to the quest for healing and balance and the dislocation of self, mapping terrain that is at once paradisiacal and tumultuous. 1970s ledgers and 19th century wills recall the basis of transactions, trade and transmutations. The discursive project White Creole Conversations featuring a collection of 25 field recordings and written interviews pay testament to the ambiguous and often contradictory ways that race and class are read historically and understood in the context of the Caribbean. Click here for more information about the artist, Annalee Davis.